Donald Trump has scrambled the political spectrum in certain ways, and one of them has been to introduce a new set of players to the national scene. “Nationalists” or “populists” (as they now call themselves), or the “alt-right” (as they used to call themselves), have been vying with traditional Republicans for control of the Trump administration. The nationalists tend to be pro-Russia, virulently anti-immigrant, race-centric, and conspiratorial in their thinking. Their current project is a political war against National Security Adviser H.R. McMaster, a conventional Republican who displaced the nationalist Michael Flynn. The nationalist war against McMaster has included waves of Russian social-media bots, leaks placed in the nationalist organ Breitbart, and undisguised anti-Semitism. Most observers outside the nationalist wing have treated McMaster as the sympathetic party in the conflict. The Intercept’s Glenn Greenwald is a notable exception. Greenwald has depicted the conflict, much like the nationalists themselves have, as the machinations of the deep state to prevent the authentic, democratically legitimate populist representatives of Trumpism from exerting their rightful authority. Greenwald himself is not a nationalist, and is certainly not a bigot, but the episode has revealed a left-winger’s idiosyncratic sympathy for the most odious characters on the right. Greenwald lays out his thinking in a deeply, if inadvertently, revealing column denouncing anti-Trump saboteurs in the deep state. The foundation of Greenwald’s worldview — on this issue and nearly everything else — is that the United States and its national-security apparatus is the greatest force for evil in the world. “Who has brought more death, and suffering, and tyranny to the world over the last six decades,” he writes, “than the U.S. National Security State?” (This six-decade period of time includes Mao’s regime in China, which killed 45 to 75 million people, as well as the Khmer Rouge and several decades of the Soviet Union.) In Greenwald’s mind, the ultimate expression of American evil is and always will be neoconservatism. “It’s hard, for instance, to imagine any group that has done more harm, and ushered in more evil, than the Bush-era neocons with whom Democrats are now openly aligning,” he argues. The neoconservatives have lined up against Trump, and many Democrats agree with them on certain issues. Since the neocons represent maximal evil in the world, any opponent of theirs must be, in Greenwald’s calculus, the lesser evil. His construction that “it’s hard … to imagine” any worse faction than the neocons is especially telling. However dangerous or rancid figures like Steve Bannon or Michael Flynn may be, the possibility that they could match the evil of the neocons is literally beyond the capacity of his brain to imagine. A second source of Greenwald’s sympathy for the nationalists is their populism. The nationalists style themselves as outsiders beset by powerful, self-interested networks of hidden foes. And while their racism is not his cup of tea, Greenwald shares the same broad view of his enemies. The opposition to Trump naturally shares a wide array of motives, as would any wide-ranging coalition. Greenwald’s column consistently attributes to those opponents only the most repellant beliefs. He doesn’t even consider the possibility that some people genuinely believe McMaster is a safe, responsible figure who might help dissuade the president from doing something terrible. Greenwald emphasizes, “Hank Paulson, former Goldman Sachs CEO and George W. Bush’s Treasury Secretary, went to the pages of the Washington Post in mid-2016 to shower Clinton with praise and Trump with unbridled scorn, saying what he hated most about Trump was his refusal to consider cuts in entitlement spending (in contrast, presumably, to the Democrat he was endorsing).” It is true that Trump promised not to cut entitlement spending. Greenwald’s notion that this promise placed him “presumably in contrast” with Hillary Clinton ignores that fact that Clinton also promised to protect these programs. The passage about entitlements appears deep in Paulson’s op-ed, which Paulson began by lambasting Trump for encouraging “ignorance, prejudice, fear and isolationism,” among other flaws. Greenwald asserts that Paulson identifies Trump’s hostility to cutting entitlements as “what he hated most” about the Republican nominee, but nothing in the op-ed indicates this is what Paulson hated most. Greenwald just made that part up. The same concoction of motives is at work in Greenwald’s contempt for McMaster and John Kelly, the new chief of staff. The pair of former generals “have long been hailed by anti-Trump factions as the Serious, Responsible Adults in the Trump administration, primarily because they support militaristic policies — such as the war in Afghanistan and intervention in Syria — that are far more in line with official Washington’s bipartisan posture,” he writes. Note that “primarily.” Greenwald is arguing that news coverage treating them as competent managers, as opposed to the amateurish nationalists, is propaganda by the elite plumping for greater war in Afghanistan and Syria. He is implying that if Kelly and McMaster took more dovish positions on Afghanistan and Syria, their public image would be altogether different. Greenwald supplies no evidence for this premise. 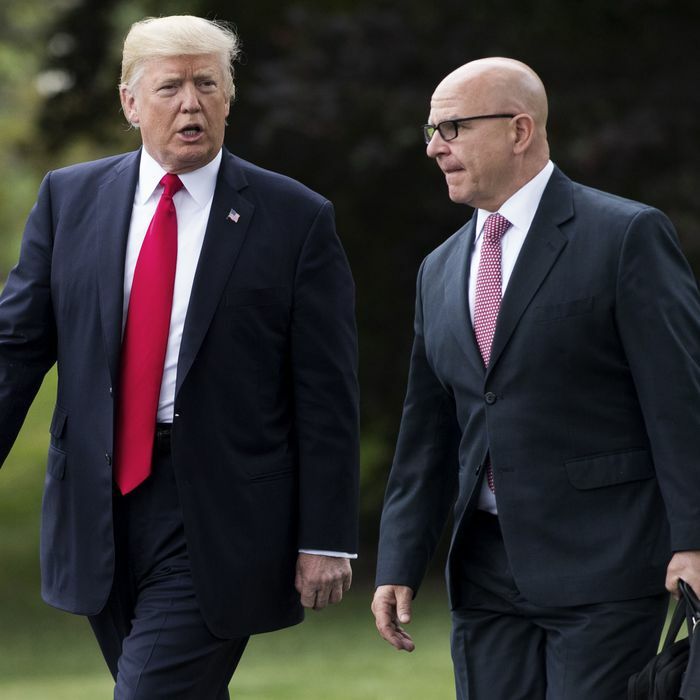 In fact, McMaster’s most acute policy struggle has been his efforts to maintain the Iran nuclear agreement, one which has placed him on the dovish side, against an established neoconservative position. Greenwald does not mention this issue, which fatally undermines his entire analysis. 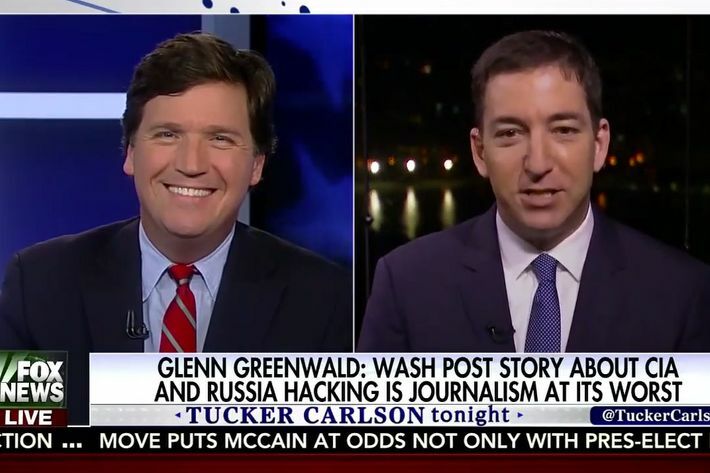 The final point of overlap between Greenwald and the nationalists is their relatively sympathetic view of Russia. The nationalists admire Putin as a champion of white Christian culture against Islam, a predisposition Greenwald does not share at all. Greenwald has, however, defended Russia’s menacing of its neighbors, and repeatedly questioned its ties to WikiLeaks. From the outset, he has reflexively discounted evidence of Russian intervention in the election. “Democrats completely resurrect that Cold War McCarthyite kind of rhetoric not only to accuse Paul Manafort, who does have direct financial ties to certainly the pro — the former pro-Russian leader of the Ukraine,” he asserted last year. (Manafort did have financial ties to that leader, a fact that was obvious at the time and which Manafort no longer denies.) Democratic accusations that Trump had hidden ties with Russia were a “smear tactic,” “unhinged,” “wild, elaborate conspiracy theories,” a “desperate” excuse for their election defeat, and so on. This closely tracks the Trump legal team’s own defense of the Russia scandal, a fact that is probably coincidental. (There are only so many arguments to make.) Greenwald is not a racist, and is the opposite of a nationalist, and yet his worldview has brought him into close alignment with that of the alt-right. A Greenwaldian paranoid would see this quasi-alliance as a conspiracy. The reality of his warped defenses of Trump is merely that of a monomaniac unable to relinquish his obsessions.